Jose's first book, "Juiced: Wild Times, Rampant 'Roids, Smash Hits, and How Baseball Got Big," was released in 2005 and changed baseball forever. Jose's second book, "Vindicated: Big Names, Big Liars, and the Battle to Save Baseball" will be out soon and can be pre-ordered for 34% off the the list price now. The Canseconet.com Email List began in 1996 and currently has 1386 subscribers. The list was a lot more active when Jose was playing, but I still send out the occasional email when Jose is in the news. If you would like to be added to the Canseconet.com Email List, fill out this form. If you'd like to see a taste of what you'll be getting, check out this archive of recent messages. The Canseconet.com Photo Galleries contain hundreds of photos of Jose. There are photos of Jose from when he played with the A's, the Rangers, the Red Sox, the Blue Jays, the Devil Rays, the Yankees, the Angels, the Newark Bears, the White Sox, the Expos, and even the Charlotte Knights.! 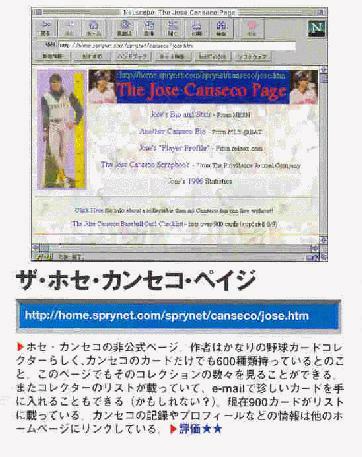 The Jose Canseco Audio and Video section of Canseconet.com is where you can listen to LIVE game broadcasts and other classic clips. You listen to Jose's classic 5th deck home run from the 1989 playoffs in Toronto or to a number of clips of Jose talking. There are even a few video clips, including some interviews and a shot of me and my famous bullseye. Visit the Canseconet.com Postcards page to view a card you have received or to send a virtual Canseco-greeting of your own. The Jose Canseco Home Run Contests are over. But congratulations to the winners of the past contests who won many prizes including autographed Jose Canseco bats and PSA graded 1986 Donruss rookie cards. To see the entire list of contest entries from the last contest, click here. I made and sold Canseconet.com t-shirts back in 1999. They have long since been sold out, but were pretty cool. I know of at least a few people who still have and wear them!. I don't update these any more, but the Jose Canseco Memories page is full of stories that were submitted by Canseco fans from all over the world! Enjoy. This page lists numerous links to other Jose Canseco sites that are worth checking out - last updated when he was playing with the White Sox. -Check out some of the awards this site has won. -This 1996 review of my site is definitely my favorite.